All eyes are on America these days. This is where the action is. We are not blind or unsympathetic to events unfolding across the planet, just limited by time and energy, and focused on the most pressing issues impacting our immediate future. I certainly never expected to see anything like this in the last days. It’s hard to believe we are actually on this ride now; after waiting so long, and the more we know, the more breathtaking it is. Thank goodness we have one main news network reporting a lot of the truth. We have much praise for the independent media, too, of course. An FYI, if you didn’t hear; the Emergency Alert scheduled for today was postponed to October 3rd—same time. 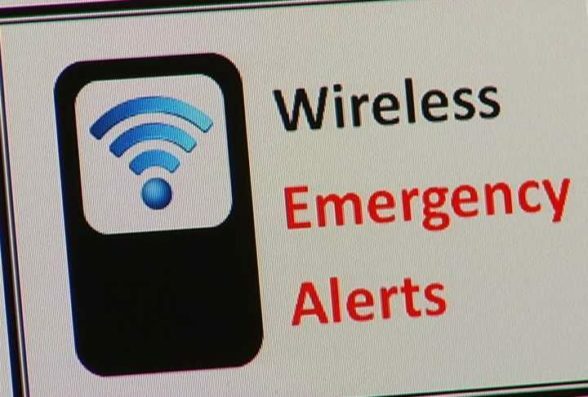 I’m hearing that this Wireless Emergency Alert (WEA) TEST is not supposed to be about natural disasters and other purposes. It is for the President, for a National Emergency of a specific kind. I think that tells us something. I don’t anticipate any horrendous events, but I do expect some disruptions in some areas as Simon Parkes elucidated in his chat with Kerry Cassidy. I recommend you listen to it. It was a major intel dump. We need to relax… we can handle this… no problem. I hope you heeded our earlier advice to prepare to make whatever transpires as painless as possible, whether it’s a temporary blackout, power outage, curfews, etc. It sounds as though it may not be widespread, but localized in a few problem areas. Simon’s advice was not to bother “prepping” for more than 2 weeks of interruptions, and Thomas Williams has also said he’s not expecting much in the way of inconvenience, either. The president spent yesterday in the Carolinas and it certainly looks as though they have the situation well in hand and will be able to deal with the heavy waters coming soon in South Carolina. When you have an administration that actually cares about the people it makes all the difference in the world. It’s states like Florida and California, Texas and Louisiana, and the Northeast where the problems are exacerbated to the point that the residents suffer. The goal in select corrupt states is not to help, but to hinder and create as much misery and destruction as possible, for as long as possible. The People will have to be proactive to take control of the crises and effectively manage them; not relying on state or federal assistance. The dirt just keeps on coming. It’s astonishing what has turned up about the “victim’s” life in such a short time. No wonder she refuses to put in an appearance. And now the attorney is exposed as well. EVERYTHING is about politics. Everything. This has become a true dog and pony show as Ford continues to “move the goal posts” almost every day. More obstructionism? I keep finding updates on this before I can publish this post. The status seems to change by the hour. We all know why Feinstein didn’t bring this up in July. It was another “insurance policy”. Weiner had one. Strozk and Page had one. Feinstein had one, too. It’s standard operating procedure for these manipulators to do this. I get a charge out of Judge Jeanine. She’s adept at cutting through the effluent spouted by the deranged lunatics fighting to stay in power and it’s good to hear someone come out and tell it like it is. How can anyone in their right mind believe the lies any more? They’re outrageous—particularly Hitlary Clinton’s last communication. Outright, unabashed lies. 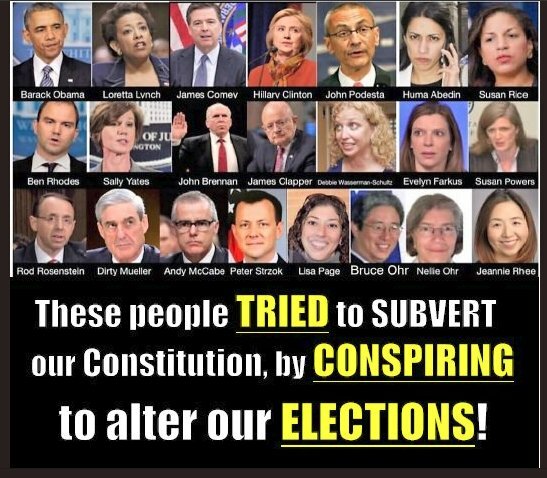 There is definitely a concerted effort to get the American people used to the fact that there are a lot of criminals in Washington and that they are attempting to dethrone the Commander-in-Chief. Therefore, when SHTF, more folks will understand what is taking place and why. It’s an unbelievable amount of drama we’re seeing, and it continues to ramp up. We can expect big moves in the next couple of weeks—or less from the sound of it—with the plan always remaining fluid, of course. 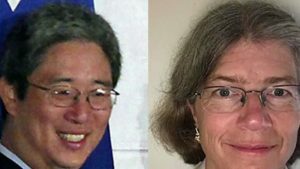 Anti-Trump DOJ Official Bruce Ohr’s wife, Nelly Ohr, is refusing to testify to Congress about her involvement in the anti-Trump dossier. Mrs. Ohr worked for Fusion GPS, the source of the dossier, and is an expert on Russia. Ohr, who worked for Fusion GPS, the firm behind the Steele dossier, was scheduled to appear for interviews during a joint session with the House Judiciary and House Oversight & Government Reform committees. But two congressional sources said that she is not cooperating with the requests and will have to be subpoenaed to compel her appearance. The Ohr’s both met with Steele, the former British spy in Washington and Ohr discussed this meeting with then Deputy FBI Director Andrew McCabe. It appears that Congress is trying to get to the bottom of what was discussed in these meetings. 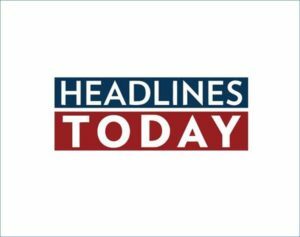 House Judiciary Chairman Bob Goodlatte is considering subpoenaing Mrs. Ohr. And now we have a shooting in Maryland. This is what psychopaths do, and I’m damn sick of the carnage and loss of innocent life. Motive? They don’t need a motive. The agenda of the psychopaths is to create a distraction; pain, misery, suffering, and perhaps to get people to scream for more gun control and security measures. These are the tactics of the degenerate sub-humans who have been running the planet. And, it is the third workplace shooting in the U.S. in the past 24 hours. Four people were shot around 10:30 a.m. Wednesday at a software company, WTS Paradigm, in Middleton, Wisc., by a 43-year-old co-worker, police said. The gunman was shot and killed by police. Three of the injured were in serious condition as of Thursday morning, one suffered a graze wound. Then, around 2 p.m., four people including a police officer were shot after a man opened fire outside a judge’s office in a municipal building in Masontown, Penn. The suspect, Patrick Dowdell, 61, was shot and killed by police. Dowdell had a preliminary hearing scheduled for Wednesday on domestic charges of strangulation, aggravated assault and terroristic threats from an incident several weeks ago. It’s Thursday today, and Thomas Williams will be hosting the regular Truth, Honor & Integrity Show tonight (a couple of hours from now) at 7:30 EDT, 4:30 Pacific if you want the latest intel updates, news analyses and probably a Q&A. You can also listen from this website. There was some information disseminated recently suggesting that Thomas supports the New Age movement. Nothing could be further from the truth. Thomas eschews the New Age movement and sticks to the facts his high-level intelligence sources provide. For example, Marduk is not a “new age” figure, but an evil ET ‘god’, who was vanquished and removed from the planet, Thomas informs us. We really need to stick to the facts as there is so much purposeful disinformation out there. 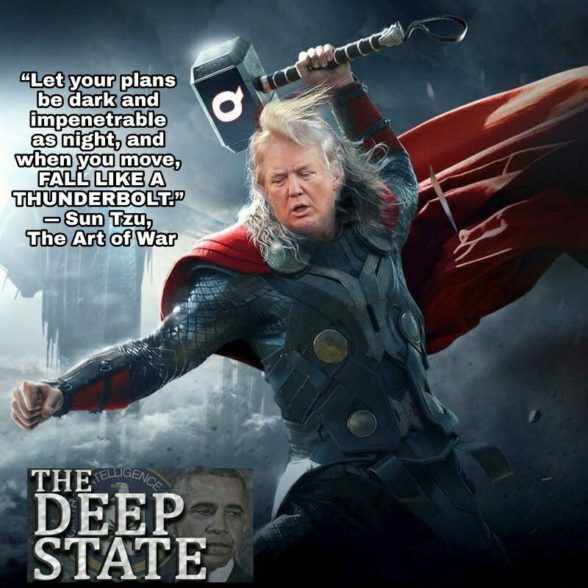 BTW, we understand from Simon Parkes that it’s possible the AI computer the QAnon team is using is under attack from other AI and we are advised to take this into consideration when establishing the validity of posts from Q. So… we have AIs battling each other? What a fascinating time to be alive. Hopefully if the posts of an imposter go up on the boards we will be advised ASAP. Q drops or crumbs are archived to several sites. The timing of updates on each site can vary. https://qanonmap.github.io/ – Not iOs friendly. https://qntmpkts.keybase.pub/ – Not iOs friendly. http://www.thestoryofq.com/ – Not iOs friendly. http://qanon.pub/ – Not iOs friendly. https://qanonmap.bitbucket.io/ – Not iOs friendly. 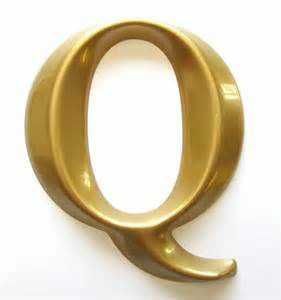 qanonposts.com was removed due to the amount of user reported technical problems(viruses etc). This entry was posted in Uncategorized and tagged AI, artificial intelligence, Brett Kavanaugh, Carolinas, Christine Blasey Ford, coup d'état, crumbs, disaster relief, drops, FISA documents, flooding, Hannity, intel, Judge Jeanine Pirro, Kerry Cassidy, love, Maryland, Masontown, mass shooting, Middleton, Nellie Ohr, October 3, Pennsylvania, police, President Trump, Project Camelot, QAnon, senate juciciary committee, Senator Dianne Feinstein, Sexual assault, shooting, Simon Parkes, Starship Earth, subpoena, test, Thomas Williams, Truth Honor and Integrity show, warrants., WEA, wireless emergency alert system, Wisconsin, X-anon, yearbook.. Bookmark the permalink.